Basque cuisine might not seem like the obvious springboard for creative fantasies. There are delicious dishes based mainly on seafood and the excellent local cheeses and breads, but there isn’t a wide variety of seasonings or vegetables to work with. It’s hearty and based on natural goodness rather than innovative combinations. 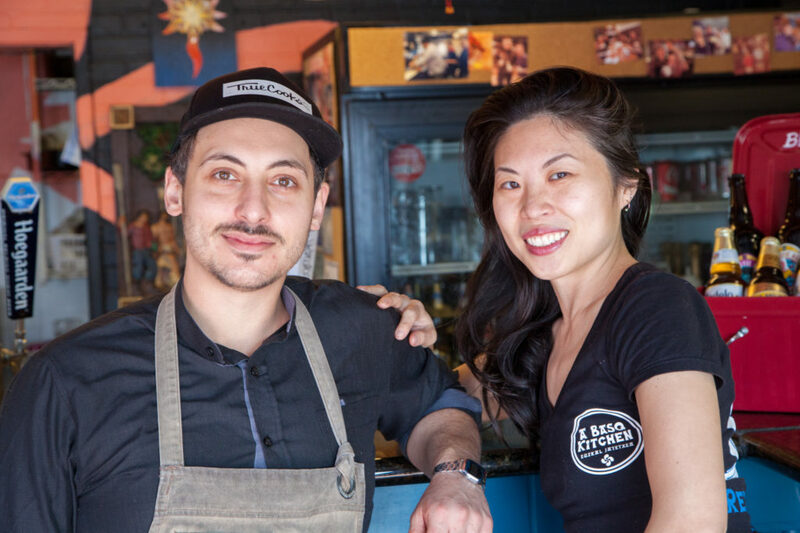 Nevertheless chef Michael Mazzotta, who previously worked at the Ace Hotel, Hot’s Kitchen, and R10 Social House among other venues, has been bringing unconventional ideas to A Basq Kitchen on the Redondo Boardwalk. The restaurant was opened as a passion project by Chef Bernard Ibarra, who spends most days as executive chef at the Terranea Resort. He established the original menu and a succession of assistants executed it with precision but without variation. Then Chef Ibarra met Chef Mazzotta, who impressed him so much that Ibarra invited him to join the business as a partner. Since then Mazzotta has brought careful reevaluations of the cuisine to the foreground with a menu that changes on a weekly basis. 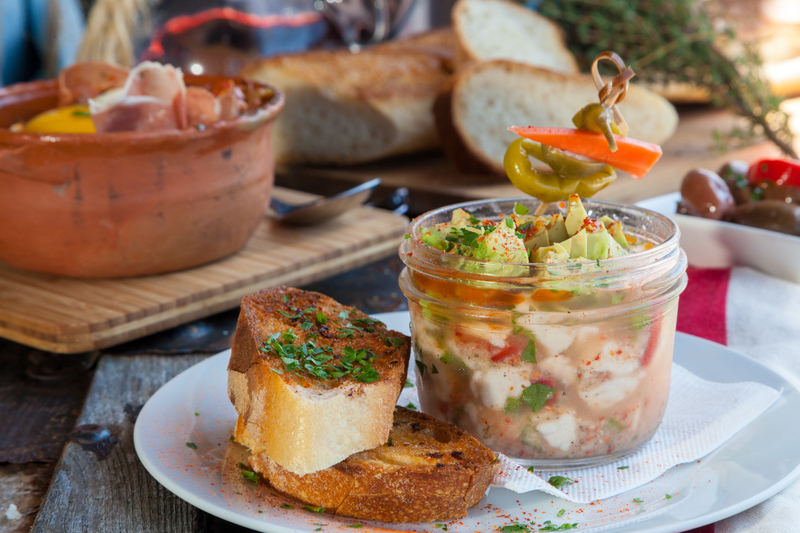 Those who have been enjoying traditional tapas like the pintxos (open faced sandwiches on sourdough rounds), seafood, and shellfish in fragrant broths don’t have to worry – they’re all still there. There does seem to be a new energy and an influx of seasonal items to complement those standard offerings. On a recent evening a friend and I tried three specials — cashew-mushroom soup, a “Gilda pintxo” topped with anchovy, spicy pickled pepper, and green olive, and an order of fried sunchokes with caramelized garlic, parsley, and espelette pepper. The soup was a mix of roasted wild mushrooms in pureed cashew broth, and though it was based on a Brazilian nut it fit the Basque aesthetic of simple natural flavors. Cashews don’t have a strong flavor but lend the broth a sweet, nutty richness that went very well with smoky, earthy mushrooms. It wasn’t a combination I had experienced before, and I’m glad I did. The Gilda pintxo took advantage of seasonal fresh anchovy and arrived looking like an avant garde sculpture, with the little fish filets sharing a wooden skewer with olives and a pungent pickled pepper. It made a pretty presentation atop sourdough toast with a dash of green salad and pickled red bell pepper on the side, but the elaborate construction had to be dismantled in order to actually eat it. My companion found the spicy peppers with olives and fish to be a little overwhelming, but I was happy to eat the part of his that he didn’t finish. He was happily chowing down on the sunchokes and on an order of patatas bravas, the spicy fried potatoes that are the Iberian equivalent of French fries. Though both were fried root vegetables there was quite a difference in flavor. Sunchokes are the edible root of the sunflower and taste somewhat like artichoke hearts. If you like those edible thistles but can’t be bothered with stripping off the leaves, this is the dish for you. The crème fraiche dipping sauce had a hint of peppery and herbal flavors and didn’t overwhelm the sunchoke, and added creamy smoothness as much as anything else. The patatas bravas were a classic done well, crisp-fried potatoes drizzled with a tomato-garlic mayonnaise with a dash of the mild espelette pepper. This is offered with extra garlic and cheese for an extra 50 cents. I’s half a buck well spent, because really, the only thing better than potatoes with garlic is potatoes with more garlic and some cheese. The portion was substantial, and if you order this with a few of the small tapas you have a meal right there. We had decided on a main course, the beef cheek stew, and another pintxo to fill in the corners. Whatever other small plates you get, that shrimp pintxo is a must. The plump prawns marinated in garlic and sautéed with herbs and white wine were superb. It’s a small plate that packs a big punch when it comes to flavor. I’m glad it’s on the regular menu because I intend to order it again. Some people won’t order the beef cheek stew because they’re not used to the idea of eating part of a cow’s head. The rest of the world finds it weird that Americans only consider eating either big steaks or ground meats, and therefore waste meat with superb flavor and texture. Cheek meat is very lean but does have some marbling, so when it’s slow-cooked every morsel is incredibly tender and richly flavored. The stew here is slow-cooked for five hours and the silky broth of tomato and spices has to be tasted to be believed. This is your best opportunity in the South Bay to taste this delicacy. I predict that when you do, you will be converted to eating cheeks. The Basques have been making wine at least since the days of the Roman Empire, and they’re particularly good at whites involving a grape called Txakolina (pronounced chocko-lena, but don’t worry, they’re used to people fumbling with this). We sampled a crisp white and a rose made with this native varietal. For comparison, we tried them alongside a glass of True Myth, a California Chardonnay. We both liked True Myth but the pickled flavors and seafood in some of the tapas were better paired with the Txakolinas. The Garnacha was a better pairing with the beef cheek stew, though if we had really been drinking like Basques we might have opted for Kalimotxo, the rustic drink of strong red wine mixed with Coca Cola. This sounds horrible, but it’s weirdly enjoyable. For dessert I’d recommend the housemade chocolate mousse and a shot of the Basque vermouth, either straight or with a little soda. Most Americans aren’t used to vermouth as a drink by itself, but the aromatic herbed wine can be a great pairing with lightly sweet, rich chocolate. The atmosphere at A Basq Kitchen is casual, the bill modest – our food ran about $60 for a meal of many small plates, with the wine just about doubling that. For an experience of a rarely encountered cuisine both in its traditional form and modified by a fine chef, it’s a bargain, and you get a view of the marina for free.